Much praise has been heaped “Days of Glory” (aka “Indigenes”). According to the poster it received a standing ovation and won a special ensemble cast prize at Cannes, and has been nominated as for Best Foreign Language Film at this year’s Oscars. So my expectations were high going into it. The verdict is, it’s a good film, but not a great one. We are put right into the story from the first scene. It’s 1943, WWII, A group of Islamic Algerian civilians are organizing to join the French military to fight for the Allies and free France from German occupation. They will be commanded by white-Algerian Captains and ultimately commanded by Vichy-French Commanders. We meet the main characters, the usual sort of crowd seen in war films. Some are there for nationalistic reasons, some for the money, but by the end of the film, there is a common purpose – allied victory, the pride of Algeria and the reclaiming the dignity of the discriminated French/Muslim people. Their first battle against a hilled strong point in southern France is, as expected, a shock to the inexperienced troops. This first scene is played out with magnificent long shots of the hill being bombarded by German mortar. The film spans 2 years and several battles, and with each one the soldiers gaining confidence in their skills. But despite this, compared to their France-born white counterparts, they are treated as second-class soldiers. There are a couple of key scenes of defiance that bond the unit together, which are effective, though scenes we have seen before. As with other war films, one of the soldiers falls in love and writes letters to his lover and there is the usual in-fighting among the troops. The events build to the liberation of Alsace. 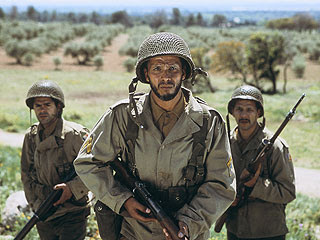 Much of the original Algerian unit has been decimated, and with their captain, hurt and unable to continue, the remainder of the unit must decide whether to fight on, or fall back. Is there ever a doubt which they will choose? The final scene in reminiscent of the final battle in “Saving Private Ryan”. They are outnumbered and are forced to fight with no other place to flee. The scene is involving and dramatic – though, again, derivative of other war films (SPR included). There is a completely unnecessary denouement, which is very Hollywood, and in keeping with the ‘new school’ of history films – flashing forward to the present to see where the survivors are now. I’m glad the film wasn’t shot with a bleach bypassed /desaturated palette as the Iwo Jima films were (again, the Spielberg-brand of war films), the old fashioned cinemascope image was breathtaking. Overall, I did get attached to the characters and by the end I really was rooting for them. This is probably a rental, unless you’re French and want to stir up your pride with another (albeit patriotic) cinematic rendition of ‘La Marseillaise’.